Waste legislation in the European Union member states derives in large measure directly from European Community directives and regulations. A thorough understanding of the applicable European law is therefore essential for all those involved in waste management and their legal advisers. 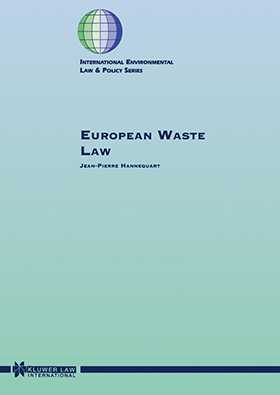 The author provides a systematic description and analysis of the framework Directive on waste, general laws relating to civil liability, regulations of specific waste management operations, and regulations specific to certain categories of waste. The book further considers the institutional framework and categories of legal measures that have shaped waste legislation, the basic legal principles arising from the Treaties and the political guidelines which lie at the basis of all current and planned regulations. The Acts and Their Authors. I. The General History of the Regulations. II. The Main Participating Institutions. III. The Legal Authenticity of Acts. IV. Sanctions under European Law. The Basic Legal Principles. V. Implicit Rules in the Treaties. VI. The Explicit Rule of the Treaties. The Political Guidelines. VII. The Action Programmes. VIII. Strategy. IX. New Strategic Guidelines. The General Regulations. X. The General Rules on Waste Management. XI. Civil Liability for Damage Caused by Waste. The Regulations Relating to Specific Management Operations. XII. Transfrontier Shipments. XIII. Transport. XIV. Incineration of Municipal Waste. XV. The Incineration of Hazardous Waste. XVI. Landfill. XVII. Dumping and Incineration at Sea.